Astartea are named after the Phoenicean goddess ‘Astarte’ and have wonderful starry flowers. 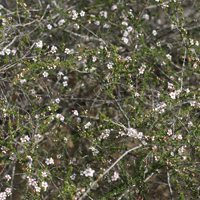 The genus is related to tea tree and are from the south west of WA. All require a well drained soil. Astartea fascicularis is probably the most readily available species. However the hybrids such as colourful and free flowering Astartea ‘Winter Pink’ maybe well be the best varieties for the garden. 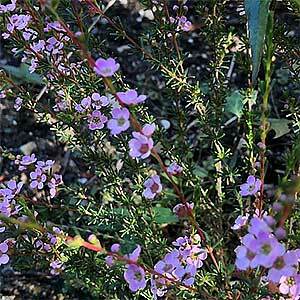 ‘Winter Pink is a variety that will reach a little over .5m in height and with a compact dense growth habit, and mid to deep pink flowers, makes an excellent garden plant. These are a medium sized long flowering shrub from Western Australia. All species are frost resistant and fairly easy to grow in a well drained soil. Look for the tall growing Astartea heteranthera (picture right) or the interesting prostrate form Astartea fascicularis prostrate. A. fasticularis is sometimes called the ‘Dainty Astartea’. The species Astartea astarteoides is commonly called the false Baekea, and indeed they are related to and often confused with Baekea. Astartea can be identified by the number of stamens on the flowers, having 15 plus stamens, Baekiea having 10 or less. A. fascicularis – White to pale pink flowers on a low growing shrub to around 1m in height. Good dense foliage and spreading to 2m. Foliage is mid green and mildly aromatic when rubbed. Long flowering from winter through to autumn. A. scoparia – White flowering taller growing species to 3m. A. ambigua – White flowers, and reaching around 1m in height. Astartea ‘Winter Pink’ is a hybrid variety now available from nurseries. A compact form with a dense habit, main flush of flowers in spring, however spot flowering from autumn through to spring is not uncommon. The flowers are a mid to light pink and the foliage an attractive green to bronze.